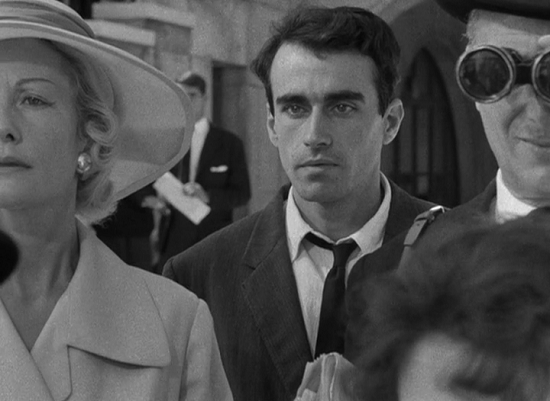 "Pickpocket," like so many of Bresson's films, is a combination of visual story-telling and narrative overlay and is certainly his finest and most accessible film. 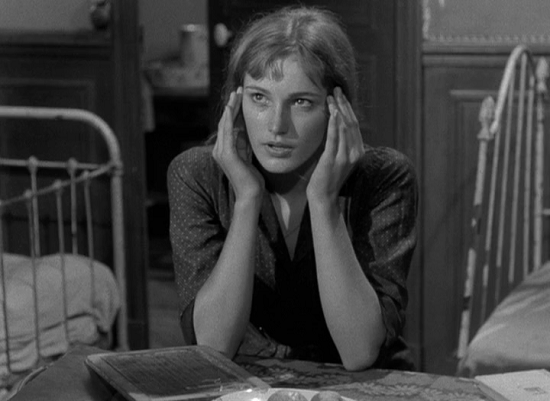 Robert Bresson uses in this one the intensely physical to explore the deeply philosophical. Depicted with an almost clinical attention to detail, the pickpocketing sequences are amazing and beautiful. It's easy to sense the fascination and perhaps even the admiration of the director as he choreographs the movements of two and later three pickpockets working together on Paris trains and at a racetrack. 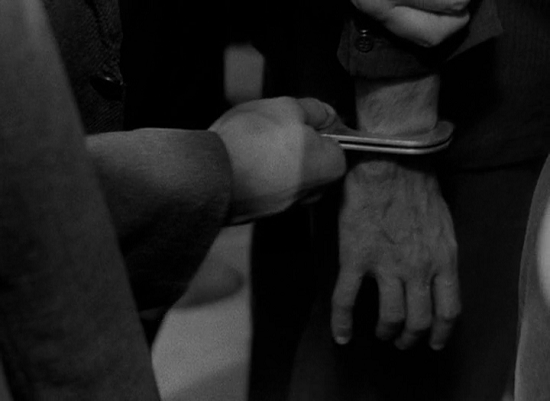 Robert Bresson drew inspiration from Dostoevsky's Crime and Punishment for this examination of an arrogant young pickpocket who deems himself above the laws and conditions of ordinary men. A young intellectual convinces himself that he wants neither human attachments nor conventional lifestyle. He is an ubermensch, above the norms of morality and society. Like Raskolnikov, although without the Russian character's horrible transgression, he begins to live outside the law. He becomes a pickpocket, eventually throws his hand in with a gang, and is finally caught and thrown into jail where, with the help of a young woman's love, he realizes that he neither has nor wants the stuff to be an ubermensch. To put it in a biblical phrase that Bresson would probably like, his heart of stone gets replaced with one of flesh. Bresson's direction of his "models" (as he calls his nonprofessional performers) strips them of affectation and motivation, making them blank slates defined by the accumulation of precisely drilled actions and words. 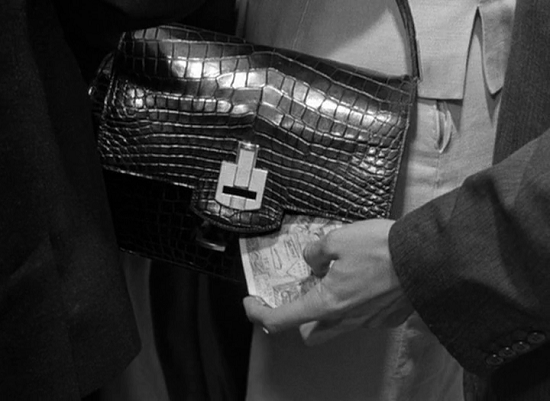 Pickpocket is no thriller, though Bresson offers impressive, meticulously detailed scenes of daring and intimate robberies (one sequence on a subway feels like homage to Sam Fuller's Pickup on South Street). Rather, it is a powerful, profound search for meaning and spiritual enlightenment by a man who believes in nothing but himself. The Story is simple. Michel (Martin LaSalle) goes to a horse race and steals some money from a spectator. He leaves the racetrack confident he was not caught when he's suddenly arrested. 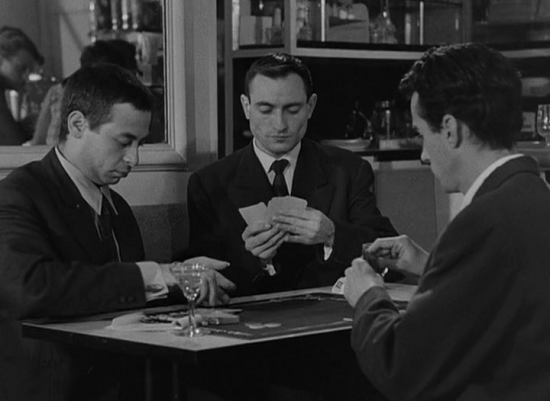 The inspector (Jean Pélégri) releases Michel because the evidence is not strong enough; Michel says it's not a crime to have cash. Michel soon falls in with a small group of professional pickpockets, who teach him their trade and invite him to join them on highly-coordinated pickpocketing sprees in crowded public areas. Visiting his mother, Michel meets Jeanne (Marika Green) who begs him to visit his mother more often. His friend Jacques goes on a date with Jeanne and invites Michel along. But after stealing a watch, Michel leaves Jacques and Jeanne at the carnival. While in a bar the inspector asks Michel to show him a book by George Barrington about pickpocketing at the station on a convenient morning and Michel goes down to the police station with it. Once there, the inspector barely glances at the book. Michel goes back to his apartment realizing that it was all just a ruse to search his apartment. However, the cops failed to find his stash of money. Michel's mother dies, and he goes to the funeral with Jeanne. Later, the inspector visits Michel in his apartment, and tells him that his mother had had some money stolen, but later dropped the charges, probably knowing the thief was her son. The inspector leaves without arresting Michel, who decides to leave the country. He tries hard to make an honest living, but throws his earnings away on alcohol and women. Returning to France, Michel returns to Jeanne, who has had a child by Jacques but did not want to marry him and is now left with nothing. Michel begins to work again to support her, but gives into temptation and goes back to steal at the horse track, where he is caught by a plainclothes policeman. Jeanne regularly goes to visit him in jail. On one such visit, Michel realizes he is in love with her. Why do we steal? Is theft always wrong? Can those who break society's moral codes ever be at ease? These are the sorts of questions prompted by Bresson's intricately detailed film. Michel (Martin LaSalle) trolls the racetracks and train stations of Paris looking for unwitting victims. When not actively thieving, he spends hours honing his craft: slipping watches off table legs with a single gesture; sliding a wallet in and out of a jacket pocket; playing pinball to increase the dexterity of his fingers. Bresson records this diligence with artful devotion. The perpetration of the crime itself, a marvel of skill and legerdemain, is artfully underscored by the music of Lully. 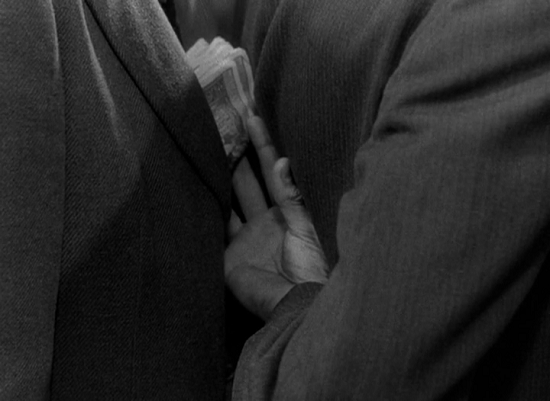 I never thought that the very act of pickpocketing could be so poetic until I watched this film. 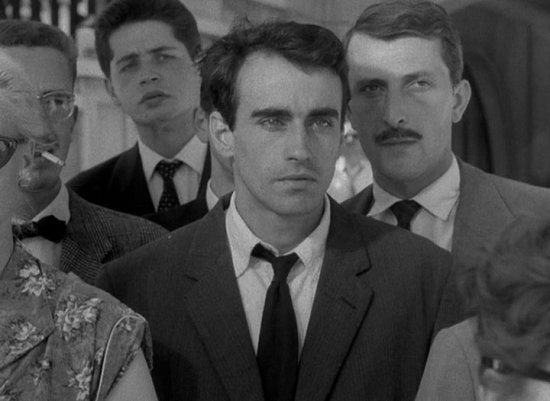 Bresson's subtle camerawork is showcased best in many scenes. In one sequence, a montage of the thief Michel learning the tricks of his trade, we are shown how he stretches his fingers and rolls a coin between them to increase their suppleness. Then, in the same shot, the hand picks up a cup of coffee and brings it to Michel's lips. The shot begins as a continuation of the montage and then suddenly changes. This one shot goes from the representative to the specific, creating a subtle jarring effect. Bresson doesn't use standard movie devices to grab our attention. A simple tilt of the camera from hands to face succeeds in accomplishing what other filmmakers might use more flamboyant techniques to achieve. Oh Jeanne to reach you what a strange path I had to take! For a brief time near the end of the film, Michel describes himself as being "at ease." He's stopped stealing and has offered to get a regular job to help care for Jeanne and her fatherless child. This emphasis on sacrifice over self ironically brings Michel – the champion of the individual – a personal peace. But can Michel sustain such self-sacrifice? That's the question Bresson forces us to consider, not only of his movie, but of ourselves. Bresson was indeed a true genius and no wonder most of the great directors became knowingly or unknowingly his disciples. 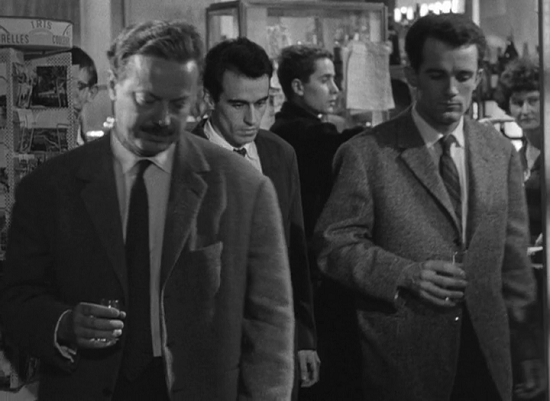 Pickpocket is one of those movies that are always held up as a paragon of filmmaking, one of the greatest explorations of character ever filmed.